Amazon Price: $143.18 $142.72 You save: $0.46 (%). (as of November 7, 2018 1:29 pm – Details). Product prices and availability are accurate as of the date/time indicated and are subject to change. Any price and availability information displayed on the Amazon site at the time of purchase will apply to the purchase of this product. As network use and broadband becoming more prevalent, the use of network storage is on the rise in combination with home entertainment and network devices. Products such as SmartTV, Xbox, Playstation3, and media/blu-ray players have increased in support for network video and audio streaming standards such as DLNA and UPnP. 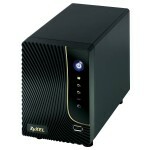 The DC01 was designed to be a powerful multimedia network storage server with compact dimensions. Constructed with high quality aluminum outer shell, dual core network processors, ability to function without hard drives, print server capability, and DLNA/UPnP/iTunes compatibility, it enables users to quickly setup a network at home or office for sharing multimedia files. An all new iSharing web interface allows user to login and store/retrieve data through a web browser with Mac-like graphical user interface that lets user operate instinctively without difficulties. A free App is also available for download from the App Store for use on the iPhone/iPad/iPod Touch to access DC01 from anywhere. With rapid advancements, small hard drives are now capable of large data capacity, this allows design team to create DC01 in smaller form factor utilizing the 2.5” SATA drive standard. 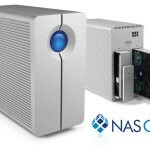 An additional eSATA port has also been implemented to support connection to external hard drives for storage expansions. Protocols such as RAID0/1/JBOD are supported as well for users to setup stripe array for speed, mirror array for redundancy, or for large partitions. For quick, on the go, storage needs, there are USB ports to support hot-swappable devices. DC01 supports S.M.A.R.T. (Self-Monitoring Analysis and Reporting Technology), which helps monitor hard drive condition and detect potential failure. It can be setup to report warning messages via e-mail to allow users to take preventative action in backing up data from the hard drive. DC01 has built-in printer server capability. 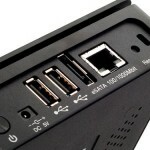 Its hardware can support connection up to two USB printers to provide printing ability to all devices in the local area network. One of the most widespread functions features in NAS (Network Attached Storage) is the built-in peer to peer BitTorrent downloader. In DC01’s download setting, a user can simply click and drag a “seed” to DC01 to enable it to automatically download files as network environment permits. DC01 allows administrator to setup user accounts with access limit and data limit. This will ensure that private or secured data can only be accessed by pre-determined individuals or devices. Contrary to regular FTP servers, DC01’s built-in FTPS server is more secure, which allows users to share data easily but with encryption. DC01 supports latest WebDAV to enable cross-platform store and access. 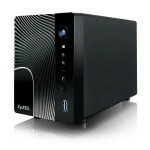 This will allow Windows, Mac, or Linux based OS to be supported via the use of web browser. 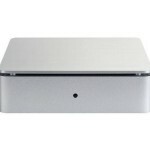 hrough the built-in DLNA/UPnP server, the DC01 can connect with supported multimedia devices such as Net TV or Smart TV to view photos or videos without the use of a PC in between. It’s the same for playing stored music and internet radio. The integrated DLNA TwonkyMedia protocol also supports streaming to Sony PlayStation 3 or Microsoft Xbox so both devices can access multimedia files stored in the DC01 . Mobile devices such as PlayStation Portable or smart phones with DLNA control point can be used as well to wirelessly access videos and music in the DC01 . Apple users will be delighted with DC01’s music sharing ability. Music files such as mp3 can be stored in the DC01 and shared via network to Mac or PC running iTunes. 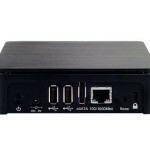 DC01 supports uninterrupted USB power delivery (USB/HID UPS). 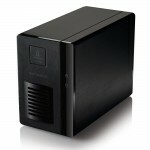 When unexpected power outage occurs, the DC01 can automatically react and protect against accidental data loss. When power delivery is abnormal, the DC01 can also automatically enter into standby mode and when power delivery returns to normal level, it will resume to whatever activity it was on before standby. Similar to “recycle bin” functionality on a desktop PC, when you delete data in the DC01 , it moves the data to a recycle folder. This will allow users to retrieve data that is accidentally deleted. DC01 records all connection records, including ones through Samba, FTPS, AFP, HTTP, HTTPS, Telnet, SSH, internet services, and login information of account users. An administrator can easily monitor all activities that happens on DC01. Quicktime web Plug-in: aif, aiff, aac, au, bmp, gsm, mov, mid, midi, mpg, mpeg, mp4, m4a, psd, qt, qtif, qif, qti, snd, tif, tiff, wav, 3g2, 3gp. Flash web Plug-in: flv, mp3, swf. Windows Mediaplayer plug-in: asx, asf, avi, wma, wmv. Thumbnails: gif, jpg, jpeg, tif, tiff, bmp, png, mpg, mlv, mpg, mpeg, dat, m2v, vob, tp, ts, avi, mov, asf, mp4, wmv, rm, ra, ram, rmvb, swf, flv, qt, 3gp, h264. Get Disk Information (Internal and External S.M.A.R.T. information). Erase Disk (only Data Disk). Format Partition (only Data partition). 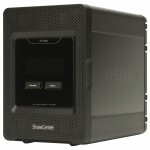 This entry was posted in 1 Bay, NAS Systems and tagged 2.5″, DLNA, eSATA, iTunes, JBOD, Raid 0, Raid 1, SATA, UPnP, USB 2.0 by Cybermarket. Bookmark the permalink.